Temujin, was the son of a Mongolian tribal chief. When he was just a boy his father was slain and Temujin would be forced to flee for his life. He wandered for years before finally returning to the village to avenge his father's death. Then, as he grew he gradually ascended in the Mongol hierarchy. He was almost 40 years old (1206 AD), when he became their supreme leader, a man the world would soon know as Chinggis(Genghis) Khan. Shortly afterward, Chinngis united all of the tribes of the steppe, a large expanse of grassland in southeastern Europe. Before long, he would organize them into an efficient and highly skilled fighting force. Then, Chinggis set out to conquer China. Chinggis had excellent leadership qualities, and the total respect of his men. He also was highly motivated, ruthless, and extremely courageous. His basic military was divided into clans and tribes, but their ultimate loyalty was to the Great Khan. At the peak of his military command his army numbered 130,000 men. By the time of his death in 1227, Chinggis controlled Central Asia, including Beijing. 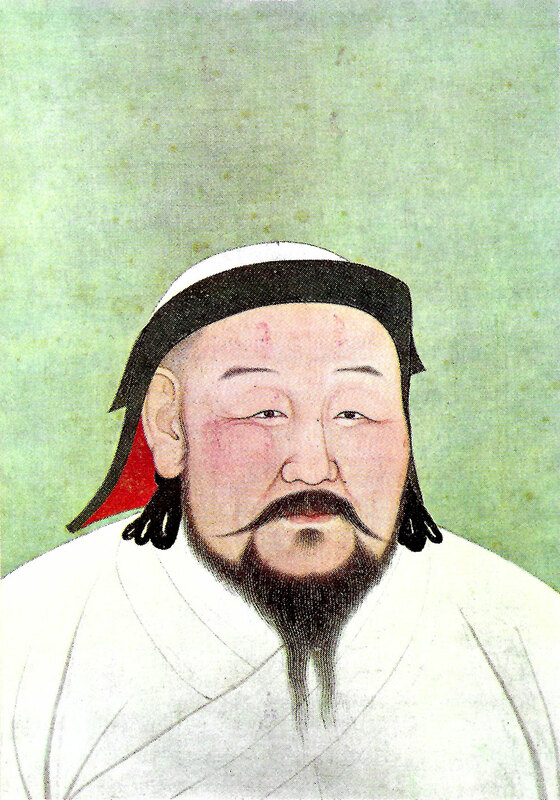 Almost a half of a century would pass before all of China would be united by the grandson of Chinggis Khan, Khubilia Khan's (1260-94). One of the first things that Khubilia did was to subjugate the Northern Sung. This was very difficult, but necessary if he were to master all of China. When he became the Great Khan in 1260, he moved his capital from Mongolia to Beijing. Then in 1271, he adopted the the Chinese dynastic name Yuan. At the time he was both Emperor of China, and Great Khan of the Mongolian Empire. The Italian merchant/explorer Marco Polo would visit him was in 1275. Next, Khan invaded Vietnam, Java, Burma, and Champa, but was unsuccessful because his troops were unfamiliar with naval warfare, and the they couldn't handle the sweltering jungle temperatures. At this time the Silk Road was open, but it would close by 1350. By the time of its closure, commodities like grain, cotton, and silk were mostly being transported by ship. Chu Yuan-chang joined a rebel band in 1352, and quickly became its leader. Eventually, his army would evolve into the Ming army. The Chinese wanted to break free of centuries of Mongol dominance. Chu would defeat numerous regional warlords before forcing the Mongols to retreat to the north in 1367. After uniting China, Chu Yuan-chang established the Ming Dynasty in 1368. At the same time, he adopted the title of Hung Wu which means “grand military achievement.” During his reign, the Chinese saw a resurgence of military strength, and agriculture production. The introduction of superior rice strains helped fuel the prosperity and a large population increase. Hung Wu surprised everyone when he reversed the trade policies of the Yuan and the Tang dynasties. It was his wish that trade be limited to a very low level. This spelled disaster for the merchants, traders, and ship owners, forcing them to turn to smuggling and piracy. By the Later Middle Period of the Ming dynasty trade would again flourish. It would be fueled by an assortment of new crops that were introduced from the Americas. It was during this time period that Ming economy started using cash currency. The use of currency resulted in a large increase in inter-regional trade. Farmers were now geared towards growing surplus cash crops such as sugar cane and indigo. The most important industries at this time were cotton manufacturing in Nanjing, silk weaving in Suzhou, and iron manufacturing in Hebei. European ships began appearing on a regular basis along the China coast in the early 16th century.